Director Zack Snyder brings to life the novels of Kathryn Lasky, a children's writer which oozes with modern fairytale goodness. For Snyder, it's also a venture into the non-adult market after the highly successful movie Watchmen and the soon to be released 2012 Man of Steel, a modern take on the Last son of Krypton, Superman. This magical tale may not hold the sway of Harry Potter or some other magical journey but Legend of the Guardians: The Owls of Ga'Hoole was still a very enjoyable film that featured some stunning CGI that looks remarkable on Blu-ray. With an almost clichéd story of good versus evil, this tale revolves around a group of young owls led by Soren who are literally being bullied by another group dastardly owls. Taking matters into their own hands... err wings, Soren seeks the Legend of the Guardians, an almost super-hero type of birds who have battled to save owlkind from the evil Pure Ones. It's time to for Soren and his friends to find the magical Great Tree, the last known whereabouts of the Guardians. Apart from the clichéd story, there's some rather impressive special effects in the movie and the owls themselves look quite realistic and move with a lifelike grace, especially the well choreographed flight scenes. 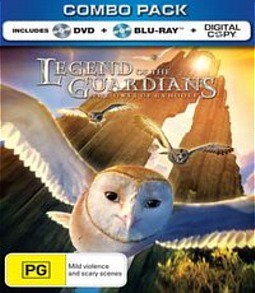 It should also be noted that the animation was created by Australia's very own Animal Logic who were responsible for Happy Feet but in this instalment, the Legend of the Guardians: The Owls of Ga'Hoole is much more realistic. Unlike Babe that used real animals, the owls of this film are all CGI created and look quite uncanny at times. With the movie being created in Australia, many of the voices in the movie sounds a little strange due to the "aussie" accents that adorn the film. With that said, some of the voices include Jim Sturgess, Ryan Wanten, David Wenham, Anthony LaPaglia, Helen Mirren, Sam Neill, Hugo Weaving and the enigmatic Geoffrey Rush who helped put the icing on top. Although the story did not jump out at me, I still enjoyed the visuals of this movie and because of it, I could easily watch it again, whether the Blu-ray version of the DVD version which also comes in this release. Perfect for kids! Legend of the Guardians supports MPEG-4 AVC-encoded 1080p with a 2.35:1 aspect ration and looks gorgeous on our FULL HD Samsung Plasma TV. Even if you're not a fan of the "fantasy" genre, this movie may change your mind because of how amazing and realistic the graphics are. With vibrant colours, sharp images and dark blacks, this is as perfect as they come and is another reference disc for Blu-ray. Match that with a DTS-HD Master Audio 5.1 mix and this creates a true home cinema experience. Every sound is clear, every voice sounds like it is in the room with you and from the little background sounds to the subtleties of the movie such as the sounds of wings flapping or the wind, it comes together perfectly through our surround sound system. This is why the Blu-ray format was created! And then you have the special features that include some fun featurettes from "The Guardians of Earth", a small documentary about owls and my favourite special feature Fur of Glying, a Looney Tunes short movie that was quite amusing. The disc is BD-Live compatible that includes a maximum kid mode that is narrated by Soren, one of the characters and goes into some specifics about real-world owls and the movie which is more of edutainment. Add in some interactive activities, a storybook version of the story, galleries and the music video by Owl City "To the Sky", this release is jam packed with goodies. Legend of the Guardians: The Owls of Ga'Hoole is an enjoyable experience that really showcases the superior nature of Blu-ray. The story can be watched be everyone and even though it's a little dark at times, you are pretty much guaranteed that Hollywood ending. The only issue with this release is that in the cinemas, a 3D version was available and it would have been nice if Warner released that version but alas, it was not to be. Nonetheless, 'Legend of the Guardians: The Owls of Ga'Hoole' is a fun journey from start to finish which once again cements the fact that Australians can make anything.